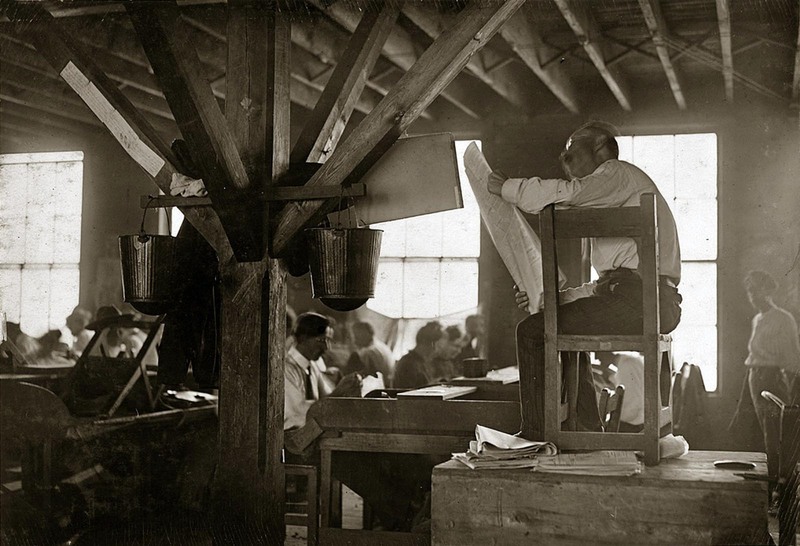 A hired reader reads to cigar makers hard at work in Cuban cigar factory, ca. 1900-1910. The practice of reading aloud while others listen intently as they engage in manual labor has a long and distinguished tradition through out the Caribbean in the practice of cigar manufacture. Because the job of rolling cigar after cigar could become monotonous, the workers wanted something to occupy and stimulate the mind. Thus arose the tradition of lectors, who sat perched on an elevated platform in the cigar factory, reading to the workers. It started in Cuba and was brought to the United States more particularly to Key West in 1865 when thousands of Cuban cigar workers emigrated to Florida to escape Spanish oppression. Historically, lectors or readers in a cigar factory entertained workers by reading books or newspapers aloud, often left-wing publications, paid for by unions or by workers pooling their money. The workers would each give 25 to 50 cents of their weekly salary to elect a fellow workman to act as “the reader” in which he would read aloud not just only newspapers, but even classical works of literature such as Tolstoy or Dickens. La lectura (the reading) provided an education for the workers, but it also caused friction between the workers and the factory owners. Picture taken in 1909 by Lewis Hine. The readers, elected by their peers, were actually marvelous actors and would not simply read the book but literally act out the scenes in a dramatic fashion upon a podium set up in the middle of the factory. They worked without amplification, so they had to be able to project their voices. Most could look at text written in English or Italian and read it aloud in Spanish, the language of the factories. Workers were both generous and ruthless to the lectors, depending on the performance. If they enjoyed the day’s reading, they would loudly tap their chavetas on their cutting boards as a form of applause. On the other end of the spectrum, workers could vocalize their unhappiness with a particular reading. Since the lector was paid by the workers, he or she took cues from them. The lector committee, not the lector, chose the materials to be read. This mattered very little to the factory owners. The lectors were forced out of the factories when what they were reading was deemed too radical. This caused widespread strikes and work slowdowns. 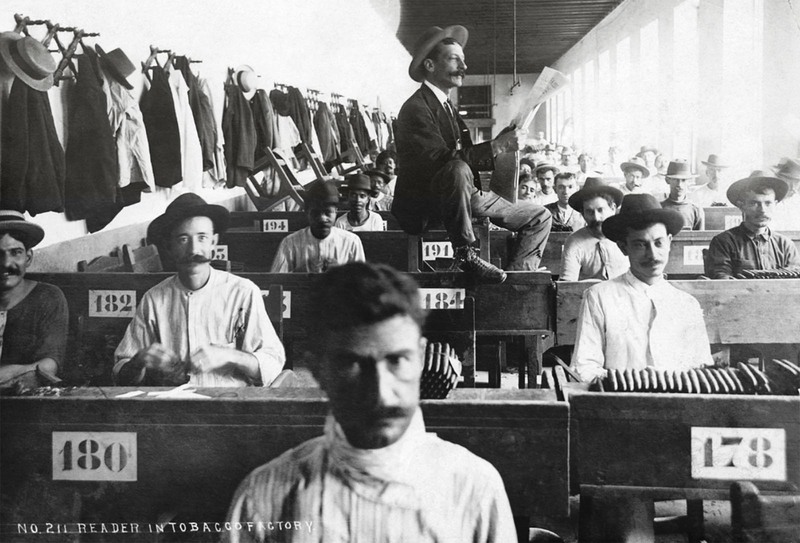 Lector in a Tampa cigar factory, circa 1930. 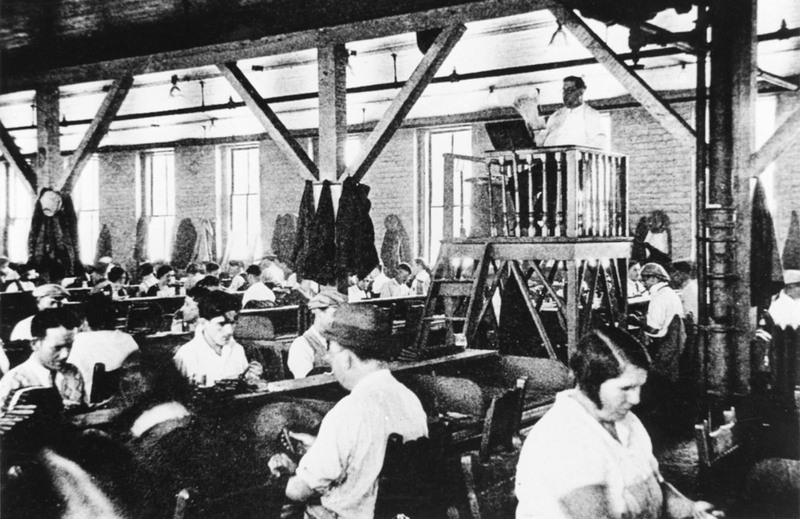 After a series of long and often violent strikes during the 1920s, over issues ranging from unions to the use of machines in the cigar-making process, factory owners began to replace the lectors with radios. In 1931, during the depths of the Depression and after another strike ended with a decrease in workers’ wages, the book also closed on la lectura. In the words of historians George Pozzetta and Gary Mormino “manufacturers replaced [the lectors] with radios, the final symbolic victory of the new industrial order over the cherished artisan privileges that had for so long sustained cigar workers”.